For the past year, our team has been working alongside the City of Salem to develop an Urban Development Area (UDA) along their East Main Street corridor. This is the second UDA project that Rhodeside & Harwell has completed with Salem. The first UDA consisted of identifying three different UDA boundaries (including the East Main Street UDA). 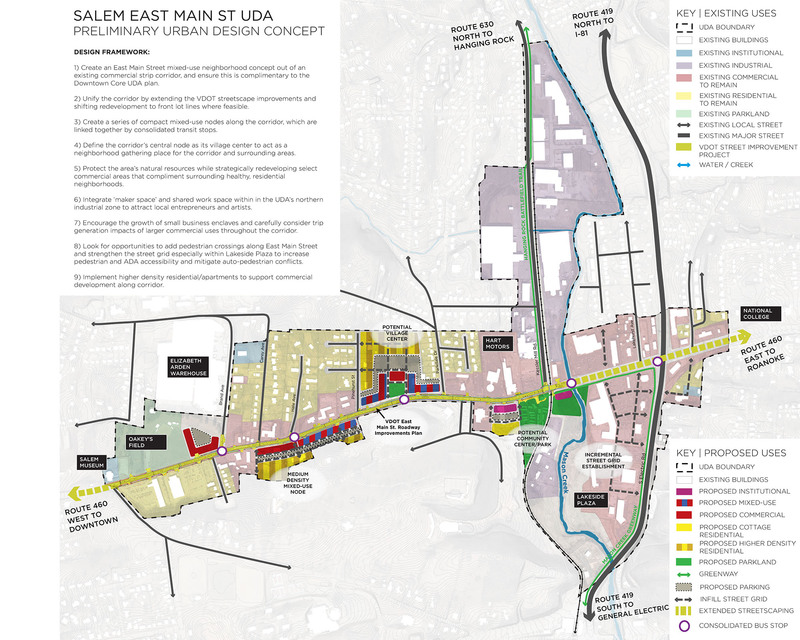 Following adoption of the first UDA, Salem applied for and received a second UDA grant to further refine the East Main Street UDA (one of the three boundaries designated in the first UDA project). – Create an East Main Street mixed-use neighborhood concept out of an existing commercial strip corridor, and ensure that it is complimentary to the Downtown Core UDA plan. – Unify the corridor by extending the VDOT streetscape improvements and shifting redevelopment to front lot lines where feasible. – Create a series of compact mixed-use nodes along the corridor, which are linked together by consolidated transit stops. – Define the corridor’s central node as its village center to act as a neighborhood gathering place for the corridor and surrounding areas. – Protect the area’s natural resources while strategically redeveloping select commercial areas that compliment surrounding healthy, residential neighborhoods. – Integrate ‘maker space’ and shared work space within the UDA’s northern industrial zone to attract local entrepreneurs and artists. – Encourage the growth of small business enclaves and carefully consider trip generation impacts of larger commercial uses throughout the corridor. – Look for opportunities to add pedestrian crossings along East Main Street and strengthen the street grid specifically within Lakeside Plaza to increase pedestrian and ADA accessibility and mitigate auto-pedestrian conflicts. – Implement higher density residential/apartments to support commercial development along corridor. 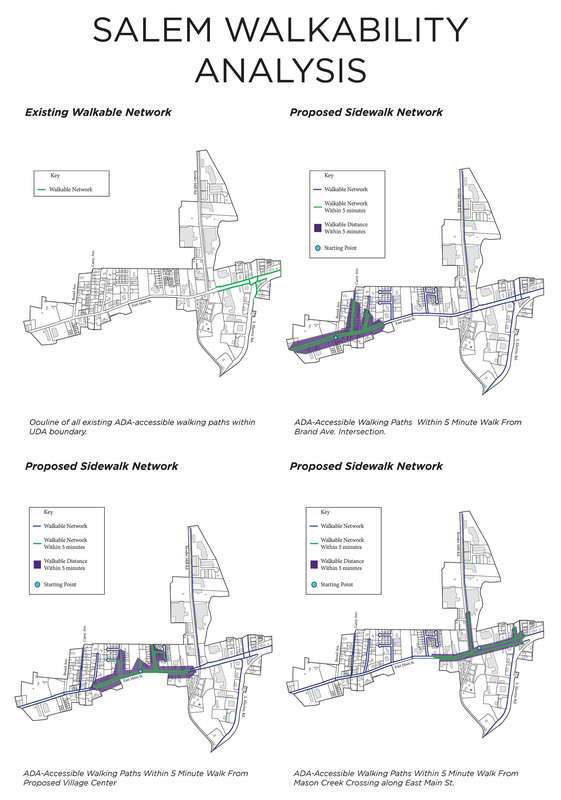 As creating a walkable environment was one of the primary objectives of the plan, a walkability analysis was conducted to ensure that the corridor is accessible to all modes of transportation and supports future mixed-use development. The analysis designated key nodes that will serve as activity centers and determined the amount of walkable network (within a five-minute timeframe) from them. This procedure helped in identifying the most efficient and cost-effective placement for improvements to the pedestrian and cycle network. The UDA plan was adopted by Salem City Council and will be a key resource in ensuring smart growth that will benefit both the citizens within the area as well as supporting the needs of the greater city. Salem has already secured a third UDA funding grant to focus on their downtown area and RHI is proud to serve as consultants to the City for this upcoming UDA!